In his first year eligible to play at Dayton, Charles Cooke certainly did big things. The 6’5″ guard/forward began his career at James Madison University, but transferred to Dayton at the end of his sophomore year. After sitting out a year due to NCAA transfer rules, Cooke proved himself a valuable part of the team in the 2015-16 season. Cooke not only became one of the Flyer’s best players, but also one of the Atlantic 10’s best. Despite it being just his first year in the conference, Cooke’s impressive play earned him the #6 spot in our top 25 player countdown. With so many solid performances turned in by Cooke this year, it’s difficult so single out one as his best. Early in the season, however, Cooke had one of his best performances against Iowa. Cooke dropped 22 points along with 4 rebounds in Dayton’s big 82-77 win in the first round of the Advocare Invitational. This win helped jump start the Flyer’s as they proceeded to the tournament championship before falling to Xavier. Beating the Hawkeyes also proved vital as the season wore on. Despite Iowa’s poor finish to the season, they did manage to crack the top 10 during the course of the year. Cooke’s great performance in this game helped seal a quality win for Dayton’s tournament resume. Throughout the course of the 2015-16 season, Cooke proved himself to be an all-around baller. The redshirt junior averaged 15.6 points this past year and shot 45% from the floor. Cooke was not only one of the Flyer’s best scoring options, Archie Miller also challenged him to get rebounds. In a game against Furman, Cooke pulled down a team high 15 rebounds. He finished the season averaging nearly 6 boards per game. The most impressive improvement Cooke made between his sophomore year at James Madison and his junior year at Dayton was his three point shooting. After shooting just 30% from behind the arc at JMU, Cooke became one of the Flyer’s knock down three point snipers. Cooke finished this past season shooting 40% from three and hit some clutch shots for Dayton all year. In just his first year eligible to play for the Flyers, Cooke made a huge impact. He started nearly every game and filled the shoes left behind by Jordan Sibert as well as anyone could ask. Cooke’s numbers and quality play earned him a spot on the All A-10 First Team. Quite a honor for only his first year in the conference. 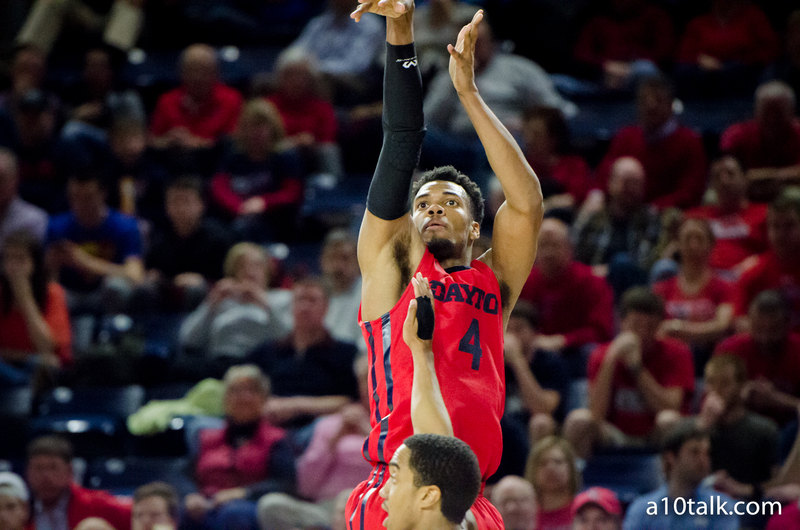 Cooke helped lead Dayton to their third straight NCAA Tournament appearance. Unfortunately for the Flyers, they failed to win a tournament game for the first time in what feels like a while. Dayton will certainly use the first round loss to Syracuse to motivate them for next season. After putting his name into consideration for the NBA Draft this spring, Cooke decided to return to Dayton for his senior year. Assuming he continues the great play, Cooke will both lead the Flyers to more success and compete for A-10 Player of the Year in the upcoming 2016-17 season.